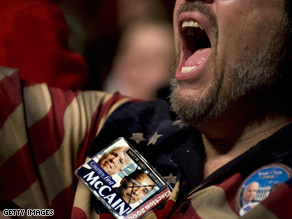 A passionate McCain supporter at a Davenport, Iowa rally this week. (CNN) - With recent polls showing Sen. Barack Obama's lead increasing nationwide and in several GOP-leaning states, some Republicans attending John McCain-Sarah Palin campaign rallies are showing a new emotion: rage. At a rally in Minnesota on Friday, a woman told McCain: "I don't trust Obama. I have read about him and he's an Arab." McCain shook his head and said, "No ma'am, no ma'am. He's a decent family man...[a] citizen that I just happen to have disagreements with on fundamental issues. That's what this campaign is all about." One man at the rally said he was "scared of an Obama presidency." McCain later told the man he should not fear Obama. "I want to be president of the United States, and I don't want Obama to be," he said. "But I have to tell you, I have to tell you, he is a decent person, and a person that you do not have to be scared as President of the United States." McCain's response was met with boos from the crowd. When asked about these outbursts, McCain campaign manager Rick Davis said that he didn't know who those people were and if they were there as supporters or to disrupt the rallies. McCain Lewis comments are only shocking to you. How does it feel to have someone attacker your character? Doesn't feel to good do it? Then ENOUGH. McCain knows exactly what people are going to say....he lets anybody say anything negative then states he does not support it..the harm is already done, which is what he wants. On the other hand, if he does not know, how does he want us to believe he can run this country, if he cannot even control his campaign? All around, shame on you Senator McCain!!!!!!! What a discrace McShame. Even as a Democrat, I had always had a respect for the person you were but now, you will leave your political year in discrace and you will always be remembered for you actions of the last weeks. If you have no power or ability to control the actions that take place in your campaign, how can the people of America believe that you could have that power or control in the White House? Your rogue (maveric) running mate has no dignity whatsoever. Go back to her first campaign as mayor where she implied that she would be the first "christian" mayor, insinuating that the current mayor was jewish, eventhough she knew he was a christian. This should not only be an insult to the jewish faith around the world, but should be condemed by all americans. The bi-partisian legislature in Alaska only confirmed what we have all watched, she is a violation of ETHICS and you have now fallen into this method of campaigning and its repulsive. If all the "non-christian, non-white, under $5 million a year AMERICANS voted for Obama/Biden, the word LANDSLIDE would have a new meaning! By the way, you can have the right wing evangelical ADULTERERS and drug addicts on your side (say hi to Cindy). those are people who are tired of the lame campaign you've run, rick davis! aren't you the one who was recieving $ from F&F up until last month? over $2 million? and you guys accuse obama of getting $ from them. obama has rec'd $16,000 from employees, during this cycle.mccain has rec'd $168,000 from employees, lobbyists and pacs of F&F. RICK DAVIS IS RESPONSIBLE FOR MCCAIN'S FAILURE IN THIS RACE. There is a frightening element in America and it is these rage-filled McCain supporters who are so afraid of something or someone different they cannot see straight and become violent. McCain brought this one by bringing in Sarah Palin and giving the ultra-conservative gun-toting types a taste of what they'd like. I used to respect McCain and throught he was an honorable man with a different ideogy from mine. But now I think he's as dangerous as his out-raged supporters. I fear for Obama and this country! Why are t hey angry? Cause the old, rich, white man is loosing to a Black man! This is another example of McCain's erratic leadership. Their incendiary statements (e.g. tagging Obama as a "terrorist sympathizer") are whipping the crowds up to a froth. It is extremely irresponsible and rips across the fabric of American society. We don't need more of this polarization in service of political victory – that's unamerican to it's core. McCain, please dust off your last ounce of integrity and provide leadership to your followers. In your last weeks before the election, set the tone for collaboration and compromise and shut the door to the hatred and rage. You say this is what you would do as President, but everything you now do speaks to the opposite. These are the same inbreds who voted for Bush!